The entry-level Acer Nitro 5 gaming laptop offers decent gaming performance without breaking the bank. 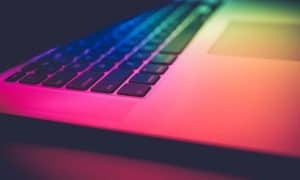 When the term gaming laptop comes to mind, most often an expensive price point follows close behind. 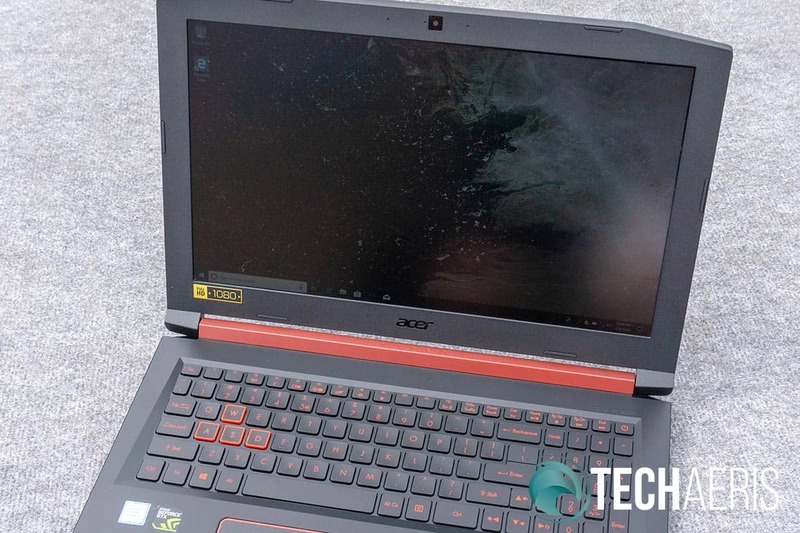 Our Acer Nitro 5 review takes a look at an affordable and capable entry-level gaming laptop with decent specifications that isn’t going to break the bank. 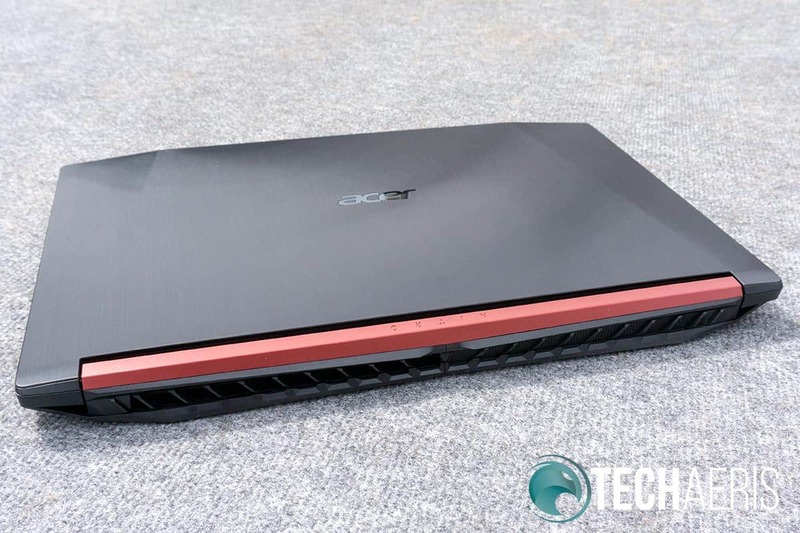 The Acer Nitro 5 has a fairly standard design with a few edged corners to give it more of a gaming laptop look. At a glance, it has a deceivingly premium build look to it, however, the metal shell is limited to the top of the lid and keyboard. 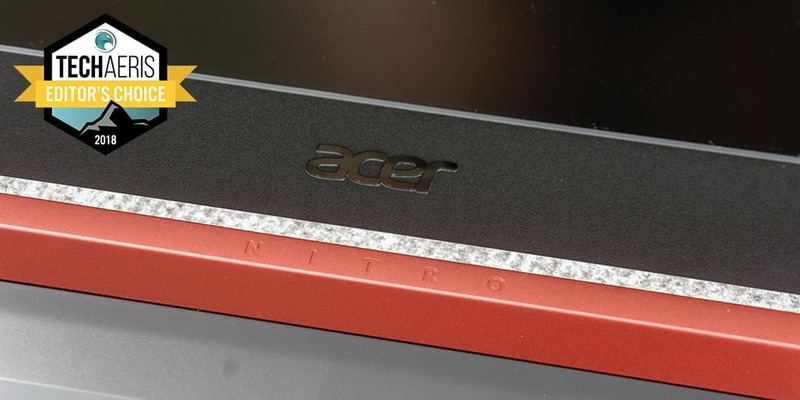 The smooth metal lid features the Acer logo in the middle and does look pretty sharp. It is hinged on both ends and attaches to the base of the laptop to a red bar with NITRO wordmark stamped into it. The top of the Acer Nitro 5 looks pretty sharp and premium. Upon opening the lid, the area around the keyboard is the same metal as the top of the lid, however, the frame around the display is plastic. 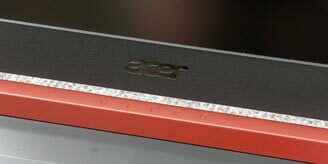 There are six rubber stoppers around the edge for when the laptop is closed and the Acer logo is stamped into the bottom bezel at the center. The bezels are quite wide as well, roughly an inch or so, tapered on the top left and right corner. The 1280×720 webcam is centered in the middle of the top bezel. The Acer Nitro 5 gaming laptop. As far as the keyboard area is concerned, the metal surface angles in towards the keyboard for a sharp look. The Acer Nitro 5 does sport a full sized keyboard, although the numpad keys are about three-quarters the width of standard keys making it a bit squished. Still, it’s nice to have a full number pad on the keyboard. It’s also backlit and the WASD keys are outlined in red for greater visibility. The typical media control, dual display, keyboard brightness, screen brightness, and volume functions are also present. The keyboard, while functional, is a little soft — especially if you’re used to using a mechanical keyboard. That being said, it is responsive and there were no major issues while day to day typing or during gaming. The 4-inch by 3-inch trackpad sits slightly off-centered, towards the left. A solid piece, the bottom corners act as left and right mouse buttons and it is pretty decent as far as trackpads are concerned. The Acer Nitro 5 packs a full sized keyboard. The main frame of the base, including the sides, is plastic as well. On the left side of the laptop, you’ll find the Kensington lock slot, Ethernet Port, Type-C USB 3.1, HDMI 2.0, USB 3.0, and an SD Card Reader. On the right side, you’ll find the power port, two USB 2.0 ports, and a 3.5mm combo headphone jack. Left side ports on the Acer Nitro 5. 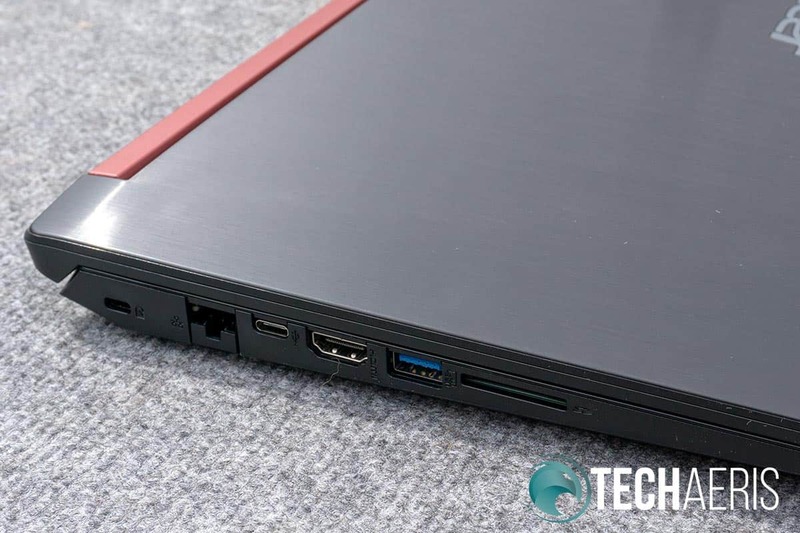 On the bottom of the laptop are four rubber feet to elevate the laptop while in use, as well as keep it fairly well in place when used on a smooth surface. Vents are located near, and extend up, the back and a removable panel allows access to the internals for easy addition of a second hard drive. 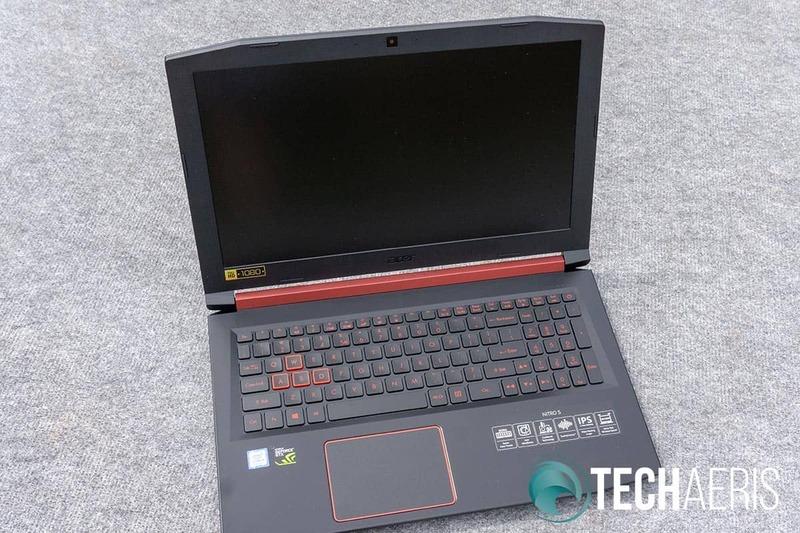 Even though the Acer Nitro 5 does have a somewhat premium look to it at a glance, the use of plastics in the frame definitely reflects the price. That aside, it still feels pretty sturdy and is an acceptable sacrifice given the internals and lower price point. The 15.6″ 1080p IPS display is decent enough. It does offer a pretty wide viewing angle and given the size was crisp and clear enough. Colours were pretty accurate as well and it wasn’t overly saturated. 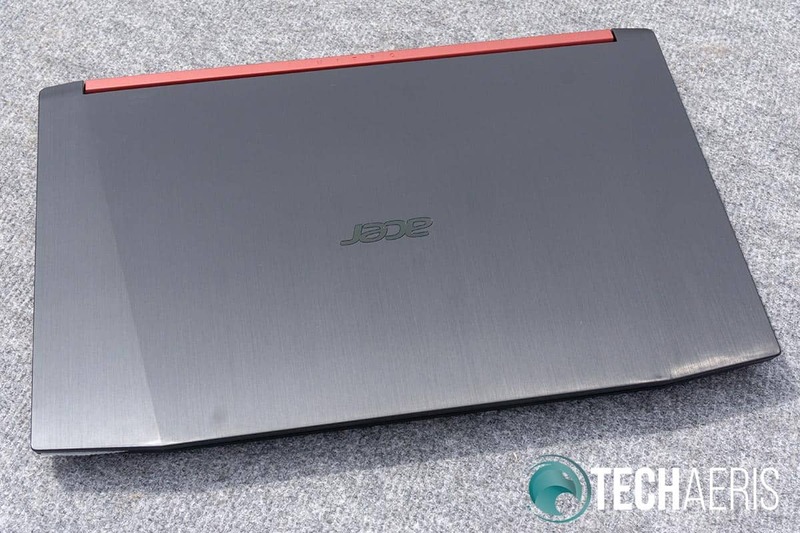 The Acer Nitro 5 features a 15.6″ IPS display. Besides the usual bloatware crap that Windows 10 has been installing as of late, the Acer Nitro 5 comes with a few Acer specific apps as well. 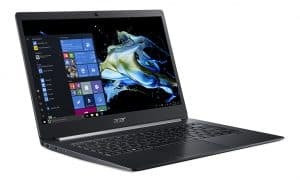 These include Acer Care Center, Acer Quick Access, Acer Recovery Management, Acer Product Registration, Acer User Experience Improvement Program, Acer documents, Acer Collection, and their NitroSense Gaming Software. Norton Security is also pre-installed on the system. Care Center gives you stats and updates for your system as well as Recovery Management, Quick Access gives you easy access to CoolBoost, Bluelight Shield, Power-off USB charging, and Power Button settings, and Acer documents is a shortcut to user guides. Acer Collection is a hand-picked selection of Windows 10 apps like Netflix, Facebook, Kodi, and others to help enhance your Windows experience. One app you will most likely want to disable is Acer UEIP which, in our case, was enabled by default and sends usage data back to Acer. 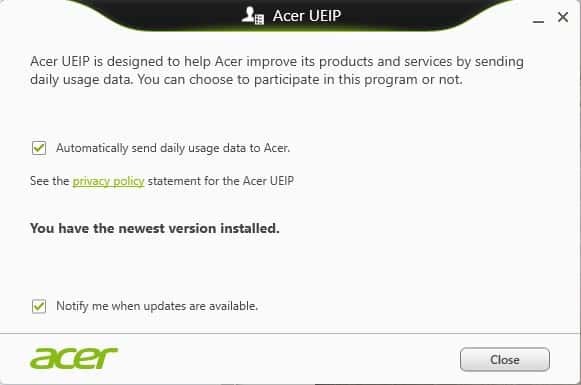 You’ll likely want to opt out of Acer UEIP. 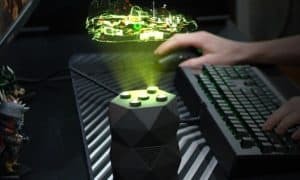 NitroSense is pretty useful in easy viewing and adjusting power plans and fan control, monitoring GPU and CPU temperature, as well as enabling or disabling CoolBoost for faster (and slightly louder) fan speed. 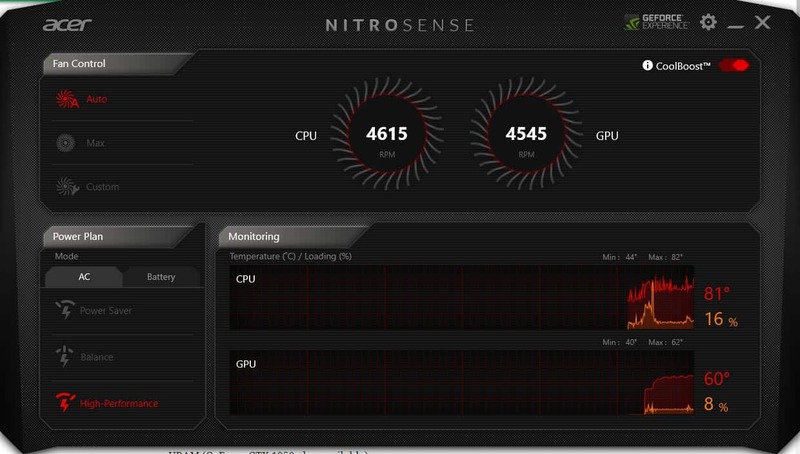 NitroSense lets you view and optimize fan control and power plans. While the Acer Nitro 5 works well enough for day to day tasks like web browsing and word processing, it is a gaming notebook and as such we put it through its paces with two of my favourite games: Heroes of the Storm and Forza Motorsport 7. In Heroes of the Storm, I immediately jacked the settings up to the highest setting: Extreme. On this setting, the Nitro 5 was able to maintain a pretty solid 65-100fps depending on the amount of action going on in the battleground. I was a bit more leery firing up Forza Motorsport 7. The game suggested Recommended settings at 1080p with Dynamic Optimization set to Default. At these settings, the game ran at its expected solid 60fps. Of course, I had to test with the settings jacked up to Ultra. The graphics difference was definitely noticeable for starters. Needless to say, the system handled 60fps for the most part with the lowest dropping down to just over 54fps — which is still very respectable. When flipping it up to Ultra at 2160p (4K), the game indicated this was above the maximum supported by the system and reverted to Ultra at 1440p. It would, however, accept Recommended at 2160p. At this setting, there were dips down to 25fps but it seemed fairly steady at around 42fps. It’s definitely not 60fps, but it is acceptable if you were hooked up to a 4K monitor. As such, even though this is a budget-priced laptop, the GTX 1050Ti is definitely a solid graphics card and easily handled the games and programs I threw at it for testing. Granted, the fans do get a bit loud when pushing the limits of the graphics card and system but that is what they are there for. Even after gaming for a couple hours with the dual fans running pretty much full blast, the system held up and didn’t feel overly hot either. 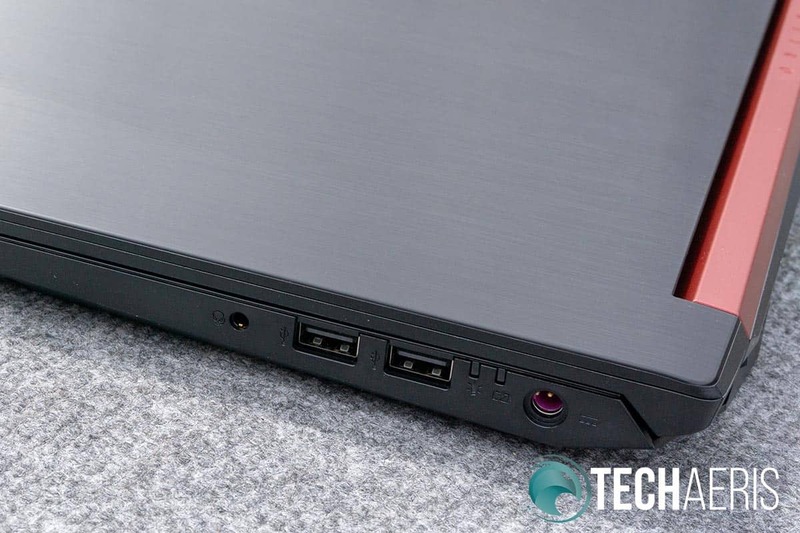 Vents on the bottom and back offer ample ventilation for when the fans kick in. One aspect of the Acer Nitro 5 that I was surprised by was the audio quality. Utilizing Dolby Audio Premium in tandem with Acer TrueHarmony, the sound is not only loud but is pretty balanced, crisp, and clear. As is usually the case with laptops, it could use a bit more bass but overall, the sound wasn’t only acceptable, it was more than acceptable. The camera offered on the Acer Nitro 5 has a 1280×720 resolution with super high dynamic range. To be honest, I didn’t notice much different between this and other onboard webcams I’ve tested lately but it’s definitely adequate enough for video chat or streaming. Battery life is the bane of gaming laptops and that holds true with the Acer Nitro 5. When used for basic web browsing and editing, the Nitro 5 lasted between 3-4 hours before needing to be plugged in. When gaming, the battery depleted much faster (as expected) and I was lucky to get a couple hours out of it. An interesting thing to note, however, is when playing Heroes of the Storm while on battery power, the framerate was capped at 30fps regardless of settings. 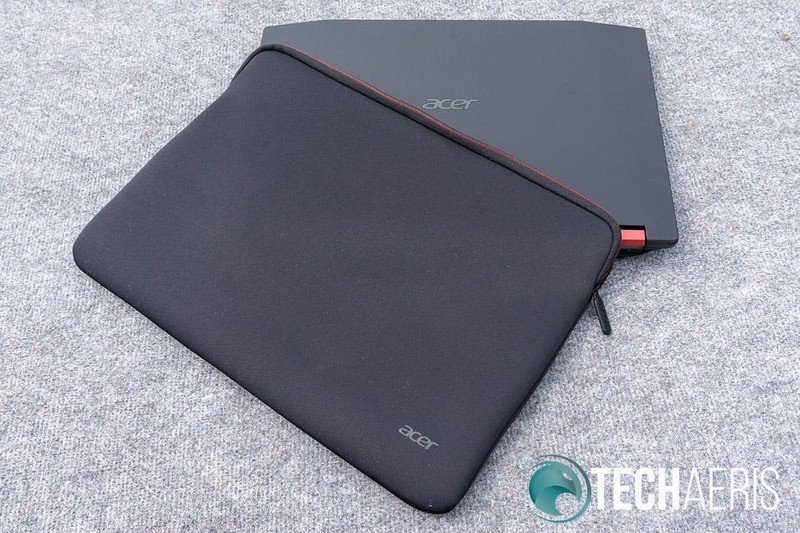 The Acer Nitro 5 also comes with a soft padded laptop sleeve. It doesn’t offer much protection aside from scratches but it is something to put the laptop in before you put it in a bag or backpack when going somewhere. While it doesn’t offer much protection, the included sleeve is a nice touch. 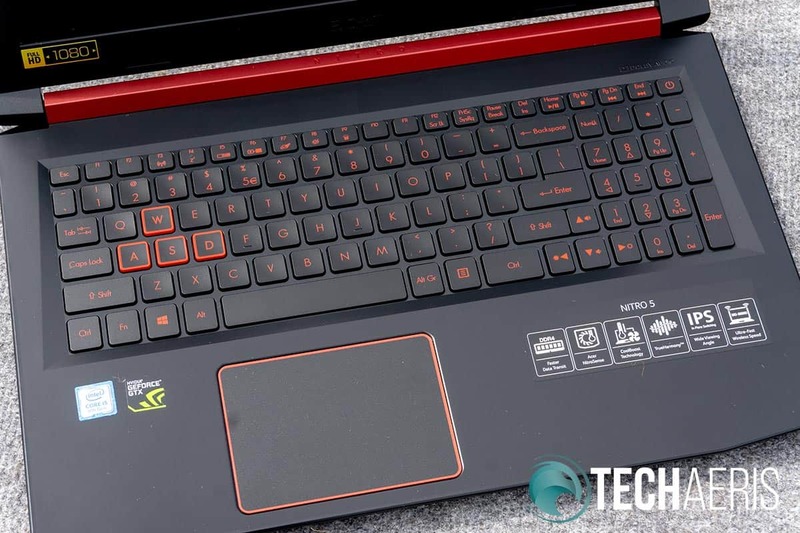 Starting at $749.99USD (our review unit comes in at $849.99), the Acer Nitro 5 is definitely a solid entry-level gaming laptop for the price. If you’re looking for decent gaming performance and not getting into 4K gaming any time soon, the Acer Nitro 5 is a solid choice that isn’t going to break the bank. 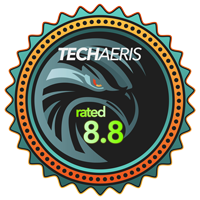 *We were sent a review unit of the Acer Nitro 5 for the purposes of this review.